(Media release) Mountain View, CA – February 8, 2016 – WSO2 today announced the guest speakers and featured keynotes for WSO2Con Asia 2016, including presenters from Capgemini, Codegen, and University of Stuttgart. Representing enterprise customers, partners and researchers, they will examine the market forces, technology developments, and best practices for advancing in the connected world. WSO2Con Asia is WSO2’s tenth user conference and the first of three WSO2Con events planned for 2016. In addition to the conference sessions, the three-day event also features several technical tutorials aimed at solving enterprise needs in the areas of integration, analytics, security, API management and more. 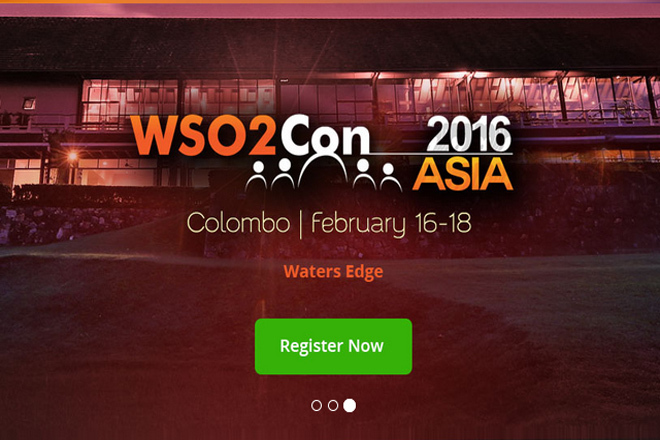 WSO2Con Asia 2016 will be held February 16-18, 2016 at the Waters Edge in Battaramulla, Sri Lanka. For more information, visit http://asia16.wso2con.com. Today’s connected world is powered by a confluence of technology developments, including mobile, the cloud, APIs, the Internet of Things (IoT), social media, and big data. Increasingly, enterprises are taking advantage of these technologies to create new connections across employees, customers and partners and gain a competitive edge through new models of agility, business collaboration, monetization and efficiency. WSO2Con Asia 2016 is focused on empowering enterprises with the technology and implementation insights to succeed in the era of the connected world. To view the full agenda and abstracts, visit http://asia16.wso2con.com/agenda. Complementing the keynotes and guest presentations will be a series of sessions and in-depth tutorials delivered by leading technical experts at WSO2. Topics will include enabling technologies and best practices for implementing mobile and IoT solutions, cloud deployments, API management, security, integration, and more. WSO2 delivers on the promise of the connected business with the only completely integrated enterprise platform that enables businesses to build, integrate and manage their APIs, applications, and Web services on-premises, in the cloud, and on mobile devices. Leading enterprise customers worldwide rely on WSO2’s award-winning 100% open source platform and its robust governance and DevOps functionality for their mission-critical applications. Today, these businesses represent nearly every sector: health, financial, retail, logistics, manufacturing, travel, technology, telecom and more. Visit http://wso2.com or check out the WSO2 community on the WSO2 Blog, Twitter, LinkedIn and Facebook.